Rocket Lab has launched its second mission in just over a month on Sunday. The Electron rocket launched at 06:33 UTC with a host of CubeSats for NASA’s Educational Launch of Nanosatellites (ELaNa) program. The 19th such mission to deploy educational CubeSats into orbit was also be the first mission procured under NASA’s Venture Class Launch Services (VCLS) program. 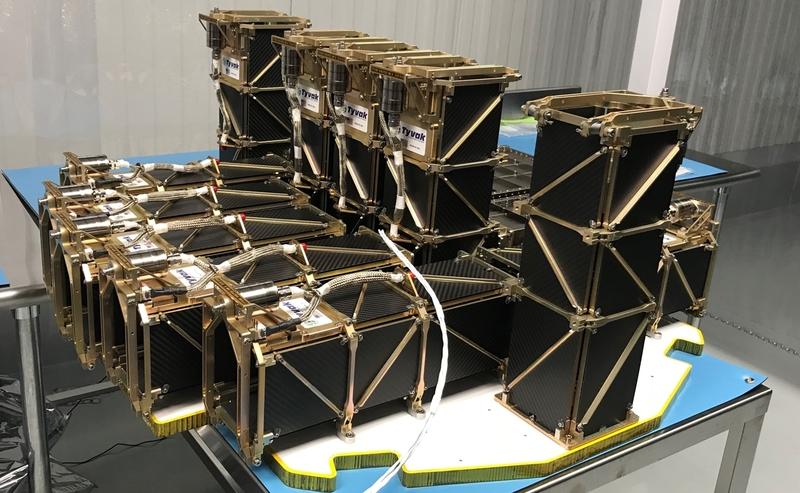 Rocket Lab, Virgin Orbit, and Firefly Aerospace were selected to provide dedicated smallsat launch vehicles to support the increasing role of CubeSats in NASA’s research. The launch was the first flight under this program, carrying 13 satellites that will advance various research goals. The Electron rocket was named “This One’s for Pickering,” after Sir William Pickering, who was born in New Zealand, led the NASA team that developed the United States’ first satellite Explorer 1, and became director of NASA’s Jet Propulsion Laboratory. This flight was Rocket Lab’s first mission for NASA. Electron carried Rocket Lab’s Curie third stage, which was used to inject the 13 CubeSats into a 500 km circular orbit at an inclination of 85 degrees. Liftoff occurred from Rocket Lab’s private Launch Complex 1 (LC-1) on the Mahia Peninsula in New Zealand. 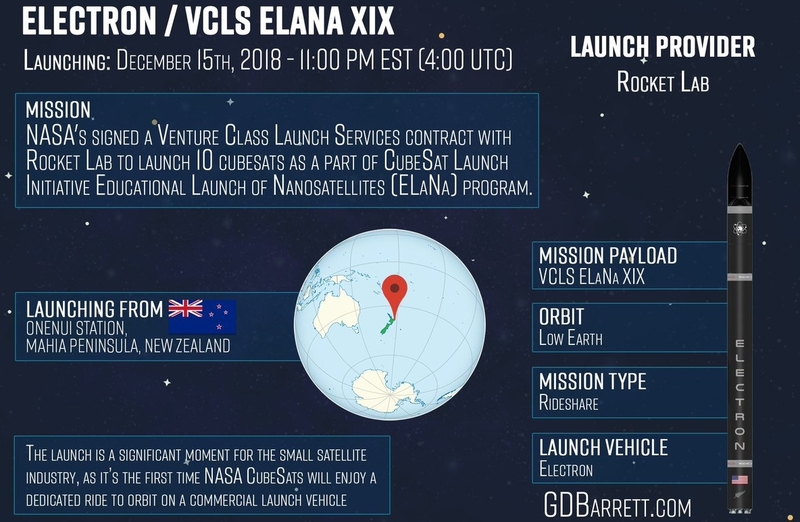 With daily launch windows from 04:00 to 08:00 UTC begin on December 13 UTC and continuing until December 21. The initial attempt was scrubbed due to poor weather. However, the Sunday attempt launched without issue at 06:33 UTC. The CubeSat dispensers underwent fit checks with the payload plate, the interface between the payloads and the rocket, in February of this year. 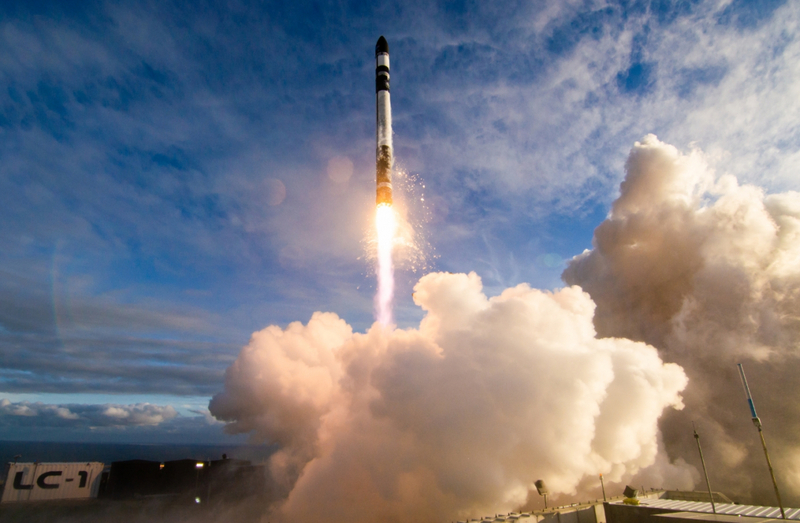 Payloads were integrated into their dispensers in April and then shipped from Rocket Lab’s facility in Huntington Beach, California to the launch site in New Zealand. Rocket Lab completed testing of Electron’s second stage on June 18 and completed testing of the first stage on November 20. The Electron vehicle then arrived at LC-1 on November 30 to be mated to the payloads and complete pre-launch testing. The payloads were encapsulated within Electron’s payload fairing in early December. Following encapsulation, the payloads were mated to the Electron rocket, which rolled out to the launch pad on December 5. A successful Wet Dress Rehearsal was completed on December 8, during which Electron and the launch teams proceeded through the full launch countdown up until just before engine ignition, including fully fueling the vehicle. The countdown to liftoff began seven hours before launch when Rocket Lab’s launch teams move into position. Electron was raised vertical at the launch pad four hours before liftoff, and the fuel tanks filled with Rocket Propellant 1. Liquid Oxygen was loaded into the oxidizer tanks two hours before launch. 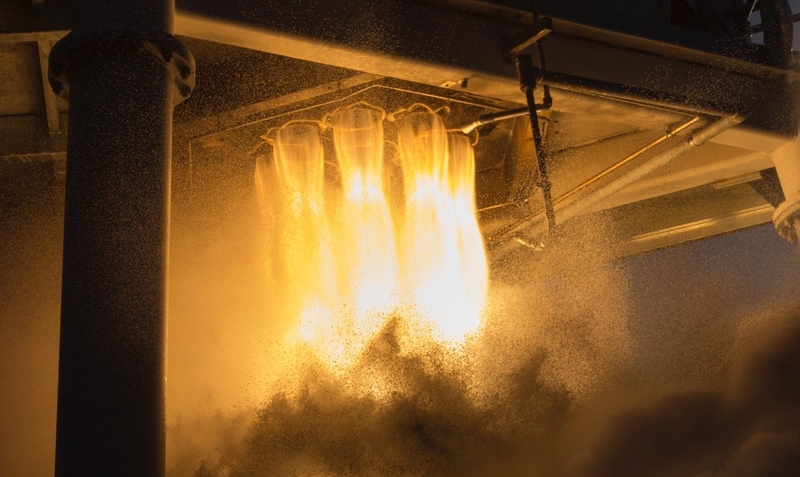 Electron’s onboard computers initiated the launch sequence at T minus 2 minutes. The nine Rutherford liquid rocket engines ignited two seconds before Electron lifted off from the pad. The first stage powered Electron upwards for 2 minutes and 31 seconds, followed by stage separation and ignition of the single vacuum-optimized Rutherford engine on the second stage. The payload fairing that protects the satellites from aerodynamic forces during ascent separated 3 minutes and 7 seconds after launch. The second stage shut down 9 minutes and 6 seconds after launch and then separated from the Curie kick stage. The kick stage coasted with the satellites for over 40 minutes before conducting a 90 second orbital injection burn. All of the payloads on board were separated from the kick stage by T plus 56 minutes. The 78 kg of payload are cubesats from both NASA centers and American universities. One of the 13 satellites is the Advance eLectrical Bus (ALBus) from NASA’s Glenn Research Center in Cleveland, Ohio, a 3U technology demonstration CubeSat that will demonstrate an advanced power management and distribution system. The satellite will be powered by solar arrays deployed by resettable shape memory alloy mechanisms and will distribute 100 Watts of power. Also on this mission is the Compact Radiation Belt Explorer (CeREs) satellite from NASA’s Goddard Space Flight Center in Greenbelt, Maryland, which will examine how electrons are energized and lost from Earth’s radiation belts. A particular area of interest is how these electrons become energized during microburst weather events. The CubeSat Handling Of Multisystem Precision Time Transfer (CHOMPTT) experiment by the University of Florida will receive and return optical pulses from and to ground stations, in order to collect timing data to compare with a clock on the ground and a pair of atomic clocks on the spacecraft. Researchers hope that data from CHOMPTT can be used to increase the accuracy of timing-sensitive satellites such as GPS. From the University of Illinois at Urbana-Champaign, a pair of 1.5U cubesats will be conducting a solar sail demonstration mission. Once deployed, the CubeSail payload will separate into CubeSail 1 and CubeSail 2, and deploy a 250 m long solar sail between them. CubeSail will demonstrate the technology for solar sail deployment in preparation for more advanced missions to research solar sail propulsion. Another payload is ELaNa-19 is the DaVinci CubeSat from the North Idaho STEM Charter Academy. DaVinci is a 3U educational CubeSat carrying a camera and communications equipment, aiming to inspire students worldwide to pursue STEM careers. Schools around the world will be able to use radio receivers to receive spacecraft health data and a message encouraging students to pursue their dreams. DaVinci will also conduct the first satellite to satellite internet connection using the GlobalStar satellite constellation. The GlobalStar satellite constellation was launched between 1998 and 2007 aboard a variety of vehicles including Delta and Soyuz variants and has been operational since 1999. The California Polytechnic University has contributed their Ionospheric Scintillation Explorer (ISX) satellite to the mission, which will study radio wave interference produced by Earth’s atmosphere. ISX will be joined by another research satellite named NMTSat from the New Mexico Institute of Mining and Technology, which will be used to monitor space weather. Another passenger, ELaNa-19, will test technology that could be used to repair spacecraft on orbit. The Repair Satellite-Prototype (RSat-P) mission from the United States Naval Academy features two robotic arms that will be moved through one or more test patterns to simulate the repair of a damaged spacecraft. Also flown are the Shields-1 spacecraft from NASA’s Langley Research Center in Virginia, and Simulation To Flight 1 (STF-1) from West Virginia University. Shields-1 will test the durability of radiation shielding materials, while STF-1 will demonstrate established simulation technologies adapted to the CubeSat platform. STF-1 was developed in partnership with Goddard Space Flight Center. A pair of Testbed for Optical Missions Satellites (TOMSats) from Aerospace Corporation named EagleScout and R3 rode to orbit aboard ELaNa-19. Both 3U CubeSats carry imaging sensors that will be compared to those used on larger imaging satellites. The final payload on the launch was the Space-based High Frequency Testbed (SHFT-1) CubeSat. The joint project between DARPA and NASA’s Jet Propulsion Laboratory aims to collect radio signals to study emissions traveling through Earth’s atmosphere as well as emissions from elsewhere in space. Rocket Lab successfully reached orbit for the first time on January 21, 2018 on Electron’s second test flight, named “Still Testing.” Aboard the test flight were two Lemur satellites for Spire, the Dove Pioneer satellite for Planet Labs, and Rocket Lab’s Humanity Star which, visible with the naked eye, encouraged people on Earth to look up at the stars. Rocket Lab then launched their first operational mission named “It’s Business Time” on November 11, carrying six satellites for four customers. Now, just over a month later, Rocket Lab has demonstrated a quick turnaround for their third and final launch of the year. Rocket Lab hopes to make quick launch turnarounds commonplace and quicken their launch cadence further in 2019. This includes the addition of Launch Complex 2 at NASA’s Wallops Flight Facility in Virginia, which could come online as early as the third quarter of 2019.